Last night’s rain and thunderstorms brought the temperature down and we woke up to an overcast and slightly chilly day. My mom was still jetlagged and she convinced me to get up at eight. We had breakfast at a nearby cafe and walked towards Boulevard St. Germain passing all the still-shut boutiques. After a failed attempt to change some money at the post office (they were on strike again! ), we continued on to the church of St. Germain des Pres and chanced upon a mass that was about to begin. We sat at one of the many empty pews in the rear and decided to attend. It turned out to be a funeral mass for a lady called Francoise. The mass was somber but beautiful and was a celebration of Francoise’s life accompanied by classical organ music, the kind best enjoyed inside a church with great acoustics. When the mass ended, we walked towards Place Furstenberg and into Flamant, one of my favorite home stores in Paris. We spent half an hour browsing around the shop then stepped out into a light drizzle that soon turned into soft, steady rain. Since all we had were our trenchcoats and no umbrella, we skipped up rue Jacob and entered Laduree on the corner to escape from the weather. Here, we sat, had a drink and talked non-stop as mothers and daughters often do and somehow managed not to order any macarons while we waited out the rain and our 1 p.m. lunch reservation at Yen. 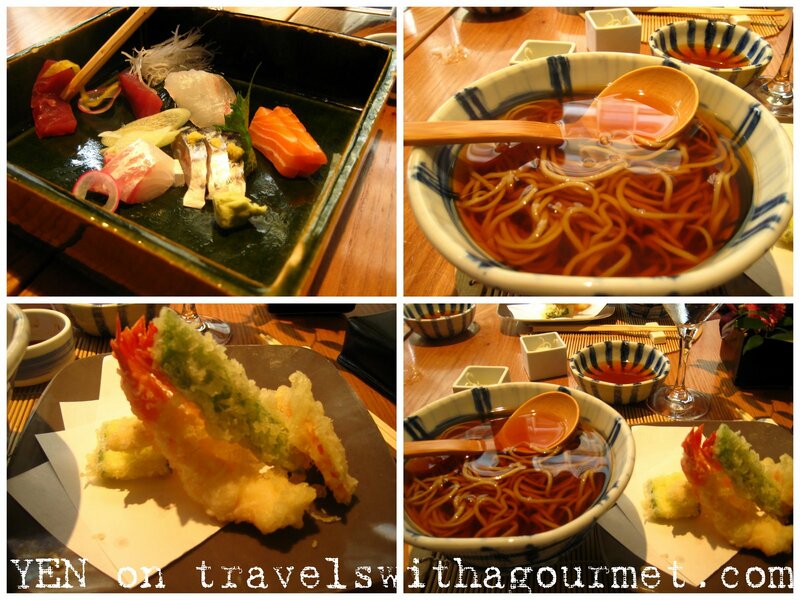 Yen is a Japanese noodle restaurant in the small side street rue St. Benoit directly behind the famous Cafe Flore. I was last here for dinner in May 2003 when my mom and I had stopped by Paris for a few days after attending the film festival in Cannes, before going to Dubai where I was living at the time. The restaurant hasn’t changed much, there is still the small area on the ground floor with a noodle making corner right by the entrance overlooking the street. There are a few tables below and a larger, windowless eating area on the first floor. Luckily, we were given a corner table right by the window. Menus were offered and drinks were ordered. The menu at Yen is limited – a few appetizers and two main courses (assorted tempura and a steak teppanyaki). Since this is a noodle house though, there was a whole section devoted to noodles – both cold and hot plus a few daily specials. We decided to share a sashimi moriawase (assorted raw fish) and then we each had a tempura soba (tempura with buckwheat noodles and broth) for our main course. The sashimi moriawase had five slices each of tuna, salmon, mackerel, snapper and another white fish. The fish was fresh and the slices were well-made, not too thick and not too fine. This was followed by our tempura soba which was served seperately – the assorted batter-covered shrimp and vegetables on one plate and the soba noodles and broth in a large bowl. This presentation was great because it kept the tempura crisp and allowed us to eat it one piece at a time with the soup and noodles. In most places the tempura is already floating in the soup so it becomes a soggy mouthful instead of the crunchy bite it’s supposed to be. There were two pieces of prawn tempura and assorted vegetables – sweet potato, flat green bean and young corn. We were so full from the sashimi and the tempura that we hardly finished our noodles and soup. After lunch, we skipped dessert and walked slowly back to our hotel to rest a bit. On our way back the rain suddenly stopped and the sky cleared. I guess that’s what springtime in Paris is like. Back again for a lovely lunch last week where my mom and I had the Bento box set lunch. Pricey at over 40 euros each but well, worth it. There were two small boxes – one with sashimi, rice rolls and vegetables, another with prawn and vegetable tempura, rare duck breast with spicy Japanese mustard and pickled vegetables followed by a large bowl of handmade soba noodles in tasty broth.